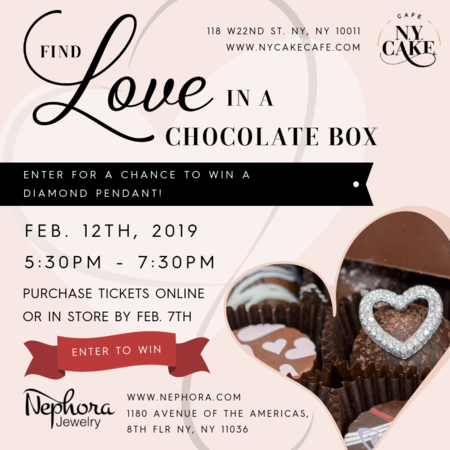 CELEBRATE THIS VALENTINE’S DAY AT NY CAKE CAFE FOR A CHANCE TO WIN A HEART-SHAPED PENDANT (RETAIL VALUE OF $3000)! Join us for this sweet affair and have a chance to win a beautiful heart-shaped pendant necklace! The heart-shaped necklace will be hidden in one of our chocolate truffle boxes, included in the cost of your ticket. At the event each attendee will be able to select their chocolate box from the display. We will then have a ‘big reveal’ where we all open our boxes and the winner calls out!